Most Royal Enfield owners in India opt for 350-cc variants, which comprise of the Bullet 350, the Classic 350, the Electra and the Thunderbird. Of these motorcycles, only the Thunderbird offers a comprehensive instrument cluster that gets a speedometer, tachometer, trip meters and a fuel gauge. 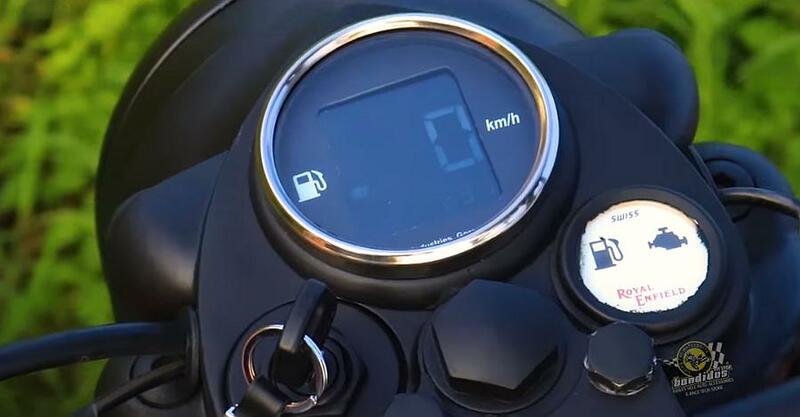 Other 350-cc Royal Enfield owners miss out on the all-important fuel gauge and have to rely on the reserve knob to find out when they’re running out of petrol. Only 500-cc Royal Enfield owners get a low-fuel warning light on the console. Meanwhile, here is an elegant solution that combines form with function. It’s a digital instrument cluster that offers a speedometer, odometer and fuel gauge, and the best part is, the stock looks are maintained. Check out this video. As the video indicates, fitment of the digital speedometer is quite simple, and should be doable by most do-it- yourself enthusiasts. Any competent mechanic should be able to handle the install as well. While this digital instrument cluster does look gorgeous, it still misses out on the fuel gauge for the 350 cc models, which is a big letdown. We’d also have liked to see a tachometer added to the display. The digital instrument cluster is compatible with all Royal Enfield motorcycles save for the Himalayan and Thunderbird, which have more comprehensive instrument clusters anyway. It’s priced at Rs. 3,999, and gets a 6-month warranty. You can buy one here. It it a good buy? For those who want something that looks very cool and maintains the stock looks of their Royal Enfields, this digital instrument cluster is a nice add-on. However, it doesn’t really add to functionality. Also, stock electrical warranty of the motorcycle will be void if this accessory is added as it involves tampering with the stock wiring of the motorcycle. So, do note these implications before opting for this product. Royal Enfield motorcycles that are out of warranty are best suited for this accessory.